KALYANESHWAR NATH TEMPLE KALNA 26:15’::86:10’ CONTINENT-Asia COUNTRY-IndiaSTATE-BiharDISTRICT-Madhubani Distance from country capital Delhi-870km -----------------State----------------Patna---150km PINCode-847211STDC-o6276 H.A.S.L-172 NEAREST RIVER_Kamala APPROACH—Madhubani is connected with roadways and railways from The rest of the country.From there local transport of auto rickshaw,time bound buses or jeep trecker etc can be taken up to trach up to the site After negotiated a distance of about 35 km AIR ROUTE-Air travel can only Be taken up for Delhi to Patna or Kolkata to Patna.. LANGUAGE-Hindi and Maithi;i.LODGING-Middle class hotel and motel are Available for stay at Madhubani.A small dharamsala is also available at the Temple siyte.FOOD-Chura dahi,rice pulse,sabji bhujia,etc available as per requirement. LOCAL TRANSPORT_-Auto rickshaw cycle rickshaw and time bound buses,are available at Madhubani. 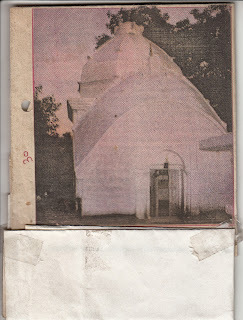 ABOUT THE SITE- Kalyaneshwar nath is a gigantic(photo view) temple about 60’ in hight of lord Shiva.Mythologically it is the place where from Janak took Ram for marrying Sita.Trisul on the peak of the temle is also very high and lofty.There is a pious pond also in which Ram took bath.Fruity trees and flower garden on the four corners of the temple pond beautify the natural asset of the temple.There is an old dug well in the campus.It is a tantric peeth also. FESTIVE SEASON-Navratra and Mahashivratri. VISITING PERIOD-All twelve month PRECAUTION-The temple is in lonely plac.So general precaution has to be taken to return to base station Madhubani in time. GUIDE-District information office may be contacted. PACKAGE TOUR-Not available. REMARKS-Important for local pilgrimage.